At Ernest Doe we stock a range of reliable Honda generators and water pumps to ensure you’ll never be caught out again. Generators are useful in a wide variety of applications, from camping, agriculture, boating, landscaping or any activity conducted at some distance from mains electricity, or simply as backup for essential operations. Water pumps are also essential kit if you need to bring water to locations away from mains water supplies, or to quickly remove excess water from boats, ponds, ditches and so on. 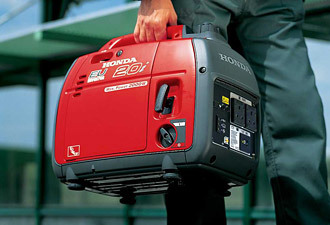 Whatever your power needs, Honda generators, with their legendary 4 stroke reliability, will certainly fit the bill. Honda water pumps are renowned for being easy to start and extremely reliable. The WX models are especially lightweight and compact, making them easy to transport to wherever they are needed – or simply be carried as emergency gear at all times. They are also extremely versatile in use and will work at just about any angle required without affecting internal oil distribution, due to its unique 360° lubrication system. 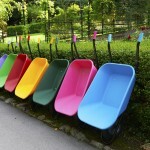 This also means that the pump can be transported in virtually any position and still be ready to use at all times. The WH range of self-priming Honda water pumps features the powerful GX160 engine. These pumps are suited to situations requiring high pressure and excellent head lift such as sprinkler systems, jetting applications, irrigation via long hoses or even fire fighting. If you are a commercial or professional user needing to move large volumes of water quickly, look to Honda’s general purpose and trash pumps. They feature a heavy duty protective frame for strength and durability, as well as a commercial grade GX engine, delivering both high performance and fuel efficiency. Finally, for movement of impure water containing silt or sand (e.g. 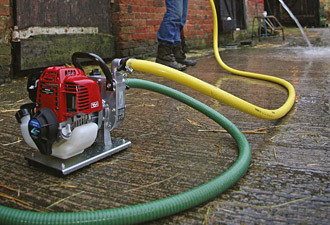 construction site, agricultural or floodwater applications) we recommend the general-purpose WB Honda water pumps. Both impeller and volute are constructed from cast iron to withstand abrasion and vibration damage is reduced using a system of rubber engine mounts. Our Honda generators and Honda water pumps are available in all of our stores, in the counties of Suffolk, Norfolk, Essex, Cambridgeshire, Kent, East Sussex, West Sussex, Surrey and Hertfordshire.